La Cucina Italiana is the new Italian Kitchen – and it’s as good as the old one. In a town that boasts so many cuisines, it seems as if we never wander very far from Italian. Why does this cuisine occupy such a special place in our hearts? When I’m asked this question, I cite its humble ingredients, the regional and family recipes and all those robust flavors. But to really appreciate Italian cooking, you need to find a place such as La Cucina Italiana and pay it a visit some evening with a nice bottle of wine. The owners have stripped away all the non-essentials and recreated the classic Italian restaurant. In the past year, we’ve become loyal customers. Located just beyond the divided section of Hamilton Street, La Cucina occupies a building that’s housed untold businesses in past decades. The owners have divided the place in half – one enters and is greeted on the kitchen side, which is fronted by a refrigerator case showing off the evening’s desserts. Then, after sizing up your party, the host leads you to your table in the dining room. The décor is striking: Old doors with crackly peeling paint have been suspended from the walls, one after the other, gallery style. Each door is mounted with ancient photographs of social groups and scenic panoramas. Just as interesting to me is the hardware on these doors. Clunky, wrought-iron doorknobs and ornate hardware hark from an era long past, when craftsmanship and imagination were still invested in mundane objects. But the main order of business is on the opposite wall – a large chalkboard listing the day’s specials. Leah, our sprightly waitress, also passed us menus and retrieved a corkscrew so I could open our bottle of wine. One thing that has helped build a reputation for La Cucina is the tripe appetizer. I fancy myself as an adventurous diner, but cow intestine remains a dish I’ve never cozied up to. My friend eagerly ordered a cup. After sampling a couple spoonfuls, he intoned, “Wonderfully spicy Italian red sauce! It reminds me of the tripe at the Italian Kitchen 20 years ago!” That, by the way, is a huge compliment. While he was exalting his offal, I enjoyed a garden salad with house dressing. In this house, the dressing is about as robust as you’ll find anywhere. Think Caesar dressing with extra Dijon and spices; it’s a flavor explosion! In a good way, that is. That tasty house dressing clung to tender greens, tomato wedges and cucumber slices and had soaked right into chunky homemade croutons. After finishing my salad, I grabbed a slice of bread from the basket and sopped up the remaining dressing. Though La Cucina never feels rushed, time between courses passes rapidly, and soon, Leah returned with our entrees. My friend’s was one of the blackboard specials, Lobster Ravioli, listed for way less money than most places. These raviolis weren’t as floppy as those served in other restaurants – La Cucina’s were about two square inches each. And there were a dozen of them swimming in a tomato cream sauce. They were stuffed with finely minced lobster flecks, perfectly delicate in flavor. When I dine in La Cucina, I hew to the basics for the simple reason that this is a kitchen that gets things right and has earned my total confidence. Case in point: eggplant. I love eggplant in all its preparations. But all too often, I’ve ordered Eggplant Parmesan only to receive pitiful little discs that look like overcooked silver-dollar pancakes. Very traumatic. La Cucina’s Eggplant Parmesan is a stack of breaded eggplant, each layer drenched with marinara and stretchy-hot Parmesan cheese. It looks like lasagna and is wonderfully tasty; the eggplant’s texture is perfect. 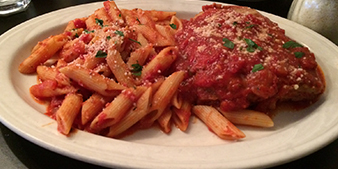 To better highlight La Cucina’s fresh marinara, it’s served on a side order of pasta. I chose ziti that evening. This is a meal you need to relax with while sipping a nice red wine. This evening, we brought a Rhode Island vintage – Sakonnet Vineyard’s Blessed Blend Red. While possessing some rich spicy flavors that allow it to match up with big food flavors, it’s also fresh and light. For dessert, we shared a wedge of the Blueberry-Lemon Mascarpone Cake. Softer and creamier than most cheesecakes, blueberries were baked right into it, and the top was schmeared with tart lemon curd. On your way out, why not stop in the kitchen and chat with the people who just cooked your meal for you? They know they’ve got something great, and recognition seems to make them happy. La Cucina Italiana’s family recipes, hearty flavors and fair prices guarantee everyone leaves happy. … I took home enough eggplant for a delicious sandwich that weekend.